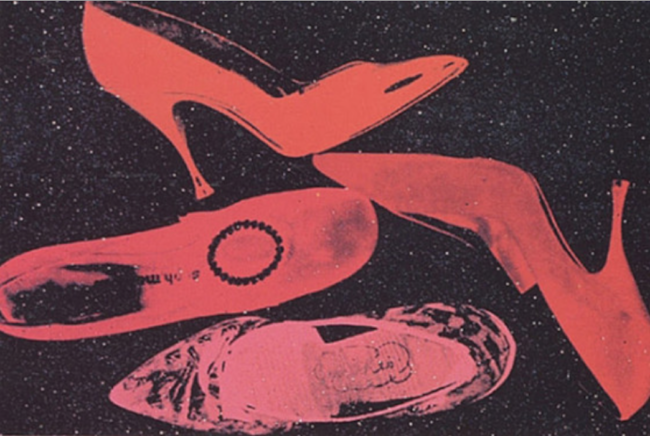 In 1980, Andy Warhol returned to his roots as a commercial illustrator, by creating his “Shoes” series. Warhol implemented his signature style of repetition, arranging the shoes in a seemingly haphazard, yet methodical manner. The composition provides a candid perspective of shoes, spilled out on the floor in no particular order, but also presents the various views of the classic high-heel, leaving no element of the shoe hidden. The conceptualization of these prints, undoubtedly, is a revival of the beginning of his artistic career in which his specialty was none other than women’s shoes.